Inverness Palace Hotel & Spa is perfectly positioned on the banks of the River Ness opposite the Castle for a short walk to Eden Court Theatre for your next show! Or a walk across the River into town to reach the latest events at Ironworks. Enjoy your show and stay overnight at the Palace with lots of extras too! Enjoy a room with a Castle View and River View at the Palace. Are you planning to take in a show at Inverness Eden Court Theatre or Inverness Ironworks? Here at the Palace you can enjoy your Inverness Showstopper break as a couple, with friends or family. Your Inverness Showstopper break is the perfect package for you to enjoy an Eden Court theatre production, comedy, music, ballet or any show in the lovely city of Inverness. You’ll find your Inverness Showstopper package offers you the best of both worlds are you are walking distance to Eden Court Theatre – just over a 5 minute stroll to the biggest theatre in the Highlands. Or 10 minute walk to Ironworks for music and comedy shows. Best Value to guarantee you the very best price for you Showstopper break the package tracks the lowest Palace Saver rate with all these added extras so prices start from £62.55 per person per night for 2 sharing a Classic Room for 1 night or more! Check your dates online for up to date pricing. 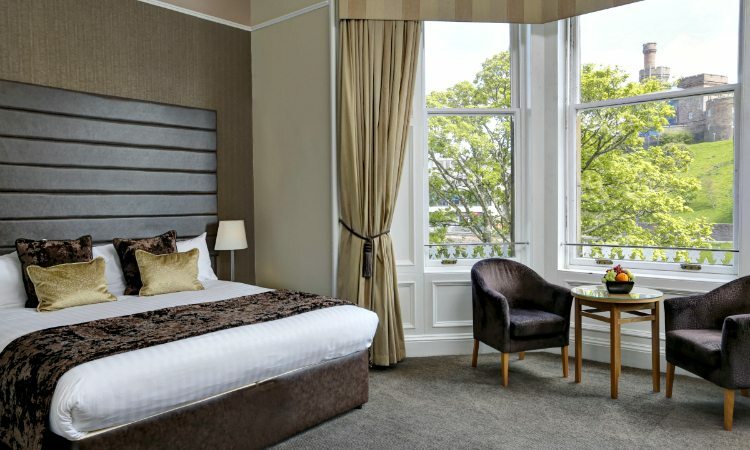 Showstopper into a Lovely River & Castle View just upgrade to a stylish period room facing Inverness Castle and the River Ness at the time of booking for only an extra £25 per person per night. Latest Show Information – book your tickets direct with Eden Court Theatre or Ironworks Inverness. See Explore pages for the latest local Events Information and a hot list below. Show Stopper package is available to 30th April and from 7th October to 22nd December and 27-29th December. It will also be available during any of the big show dates below. The team at Eden Court Theatre have put together an outstanding programme for 2019 so here are the highlights of some of the big shows in theatre and musicals coming this year. Priscilla Queen of the Desert – 18th – 23rd Nov at Eden Court – the iconic musical PRISCILLA QUEEN OF THE DESERT is coming to Eden Court! With more glitter than ever before, this smash-hit show features a dazzling array of stunning costumes, fabulous feathers and a non-stop parade of dance-floor classics including IT’S RAINING MEN, I WILL SURVIVE, I LOVE THE NIGHTLIFE and FINALLY! Based on the Oscar-winning film, PRISCILLA is the hilarious adventure of three friends who hop aboard a battered old bus bound for the Outback to put on the show of a lifetime. Their epic journey is a heart-warming story of self-discovery, sassiness and acceptance. Beauty & The Beast Panto Mime at Eden Court from 6th December to 5th January 2020. Note – All prices are per person per night based on 2 sharing a double/ twin room and are subject to room availability. For family rooms please call us to book. All seasonal packages are advance purchase with payment required at time of booking and are non cancellable. No show/ event tickets are not included in any prices above, all tickets must be booked by yourself direct with Eden Court or Ironworks or the appropriate venue. Your Showstopper Break starts with your welcome mini bottles of Heritage Patriarche Red & White wine! Pre-Theatre at the Brasserie - relax and enjoy your 2 course Pre-Theatre meal before your show! After Show Nibbles with your sharing Cheese platter when you return to the Palace. Sumptuous Buffet Breakfasts enjoy your fab hot and cold Scottish buffet breakfast every morning perfect for the winter. Free access to Leisure Club - you can stretch out on a lounger and relax in the 84 degree warmth before or after your Show! Unwind - you can also enjoy the lovely 50 foot swimming pool, sauna and steam room! Sanctuary in the Spa treat yourself and book a treatment in the Sleeping Beauty Spa.